Tasting Notes: Orange oil and baked song cake. Hey, barley sugar sweets, baked pumpkin. Fibrous on the palate, banana skins change to malt cereal and driftwood. White flowers and shortbread. Hard orange cheese and blotting paper. Tasting Notes: Grape Hubba Bubba and purple fruits. Dried apricots, supermarket honey. Pink peppercorns on the finish. Tasting Notes: Meaty, hoisin sauce and zippy lemon. Macadamias, lemon cream and foam bananas. Layers of tartness on the back palate finish with a hit of rancio. Tasting Notes: Nose of an old library, fur jackets, pink apples and dried strawberries. Dates and cheap cola. Celery, Curly Wurly, apple and cinnamon finish. Tasting Notes: Raspberry Weiss ice-cream, pink marshmallows, milk foam and cloud lollies. Cough medicine, dry pepper and coconut finishing with aromatic bitters. Tasting Notes: Maple syrup coated bacon, paprika and plum sauce with duck. Crispy barramundi skin, damper and a thick slice of Domino’s smoky BBQ pizza! Finishes with chipotle. Tasting Notes: Green olives, brine and popcorn. Syrupy on the palate with flavours of corn flakes in fresh milk, chargrilled capsicum and salty butter. Tasting Notes: Green moss, roasted peanuts and burnt iced coffee. Burnt capsicum, chilli and ripe banana skins. Tasting Notes: Orange jubes, kelp and white sugar. Lime sponge, Talcum powder, salty satay sauce and neoprene on the finish. Tasting Notes: Betadine, forest floor after rain and burnt greenwood. Asparagus, barnyard and cheese biscuits. Tasting Notes: Floral lemon and teacakes topped with canned whipped cream. Lemon zest, wet mossy rock and cow udder. Pleasant hints of sandalwood and black tea finishes with fresh earth. Tasting Notes: Fresh dill, sarsaparilla, vanilla root beer and Huon pine. Iced vovos and vanilla cola, Haribo cherry, cajun spices and cherry ripe. Tasting Notes: Clean and floral. Pineapple, banana custard, orange blossom and perfume. Creamy rainbow Paddle Pops. Bottled at the perfect ABV. Tasting Notes: Fruit pastilles, passionfruit pulp and toffee apple straps. Cucumber sandwiches, petrichor and peach flesh. Tasting Notes: A nose of new Converse kicks, pine, latex gloves and hints of green apples. Pork and chive dumplings, oyster sauce and chalky protein bar. Tasting Notes: Caramel, frangipan, malt and a puff of peat. Mochi red bean paste and raspberries develop into a finish of white chocolate, and honey soy. A hint of sherry cask maturation style of the 1990’s. Tasting Notes: Grape Zappo lollies, lime marmalade and Splice ice-creams. Apricot, Italian tart crust, Greengage plums and dark purple fruits. Clean and lip-smacking! Tasting Notes: Dusty old boots, pepper steak, Capocollo salami and spent gun powder. Finishes with mango, pineapple and tropical fruits. Tasting Notes: A subtle nose with zingy orange and barbecue lemon. A silky mouthfeel delivers hot sand at the beach, mineral, roasted marshmallow, lemon sorbet and spent ground coffee beans. Could almost benefit from a higher ABV. Tasting Notes: Boot polish and coal tar soap hit the nose first. MacDonald’s cheese burger patties, damp rope and driftwood. Iron filings and soluble panadol or aspirin. Tasting Notes: Love heart candies, fruity and smoked meat bark. Strawberry milkshake, mandarin, fairy bread and soft clean pork fat. Very fruity and with an almost unrecognisable distillery character… until the very finish. 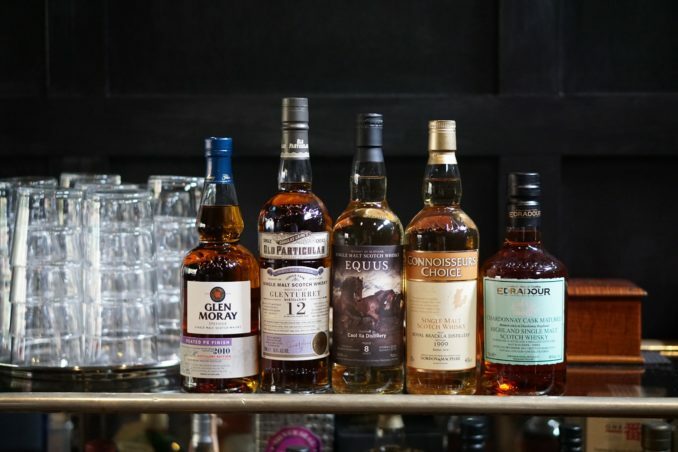 *On pour at Whisky & Alement from Wed 16 January 2019. Tasting Notes: Coffee eclairs, salted caramel, pears and oats. Fresh saw dust, spiced custard, a hint of graphite and peat on the finish. Tasting Notes: Lemon balm, cinnamon toast, vegetal, floral, dry grass. Damp old oak, orgeat, pecan pie with a finish of fresh green foliage, peach and toffee. Tasting Notes: Lime jelly, spiced mead and pistachio ice-cream on the nose. Flaky pastry, lemon, seaside salt and guitar cases. Tasting Notes: Honeycomb, creamy palate of stone fruit and buttery pastry lead to a short finish. Banana chips, butterscotch, garden chervil, lemon and saffron. Tasting Notes: White jellybeans and cheap lemonade on the nose. Imperial leather, peppermint, overall a meaty, salty palate. Borek! Pineapple and grapefruit side .. or is that sweet grape soda? Tasting Notes: Salted roasted brazil nuts, oysters kilpatrick, roast dinner and barbecue sauce! Hot leather and sticky brisket. Filthy and sooty with an afterthought of Burger Rings! Tasting Notes: Raspberry coulis, dried apricots, apricot brandy and smoked fig. Bright orange sherbet, fruit chocolates and moss. Tasting Notes: Old nanna pink soap, fabric softener, gingerbread men, baby powder and marshmallow. Strawberry milkshakes, foam bananas and Bounty chocolate bars. Tasting Notes: Walnuts, poppy seeds, spices and clove on the nose. Mascarpone, sour cherry cola, ginger, sarsaparilla and lime liqueur on the palate finishes with liquorice all sorts and more clove. Tasting Notes: Maraschine, rose water and cinnamon on the nose. Oat cakes, cinnamon, neoprene, Playdough, glace cherries and fondant finishing with tinned lychees. Tasting Notes: A nose of cherry cola, sarsaparilla, root beer and parmesan sweat. Black sour cherry, maraschino, apricots, raspberry, fruit tea tannin, lime marmalade, pomegranate molasses, lamb and blackberry jam. Fantastic! 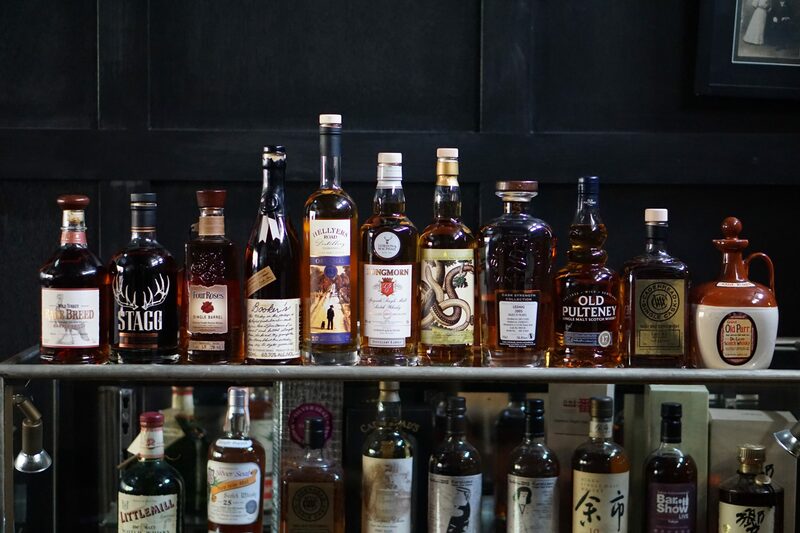 *On pour at Whisky & Alement from Wed 23 January 2019. Tasting notes live from Thu 24 January 2019. Tasting Notes: Soft and sweet, dry oaky spice, Play-Doh and frying butter. Sour cherries, white flowers, cardamon cloves and sarsaparilla. Tasting Notes: Grape soda, purple slushy and maraschino cherries. Orange and potpourri, cedar and new pencil cases. Tasting Notes: Milky pasta, malt spice and grapefruit. Wet hay, raspberry sherbet and green grass. Tasting Notes: Green apples, jasmine, cookie dough and coconut sweetness. A clean whisky, rum and raisin ice-cream, grape soda and lemon sorbet. Tasting Notes: Gunpowder, cherry jam, sticky szechuan sauce. Raspberry concentrate, red frogs and maple syrup. Tasting Notes: Cocao and dark chocolate ovaltine. Meat pies, honey dew melons on the nose. Tasting Notes: Carob chocolate, chocolate wafers and barrel aged pickle juice finishes in pencil shavings. Tasting Notes: Barley, sugar and Yorkshire pudding. Tangy, sour coke bottles, creamy guava. Responds well to a touch of water. Tasting Notes: Berry compote, caramelised burnt sugars and french toast with cinnamon sugar. Honey soy cashews and sesame snaps. Tasting Notes: Pencil shavings, vinyl pencil cases and honey dew melons. Sakura mocha, pine box, mint ice-cream and coconut rough! Tasting Notes: Jammy dodgers, mineralogy, charcoal hints, fig jam and newspaper ink. Salted caramel and butterscotch. Tasting Notes: Wool shed, drift wood and lanolin. Tarry ropes, burnt lemons, ceviche, flint and limestone cliffs. Tasting Notes: Cardamon, balsamic vinegar, Moroccan spice and fruits, frankincense, sun dried apricots/peaches and port jelly. Tasting Notes: Petrachor, soft peat on the nose, smoked ham sandwich, yuzu and lemon zest on the nose. The palate delivers Moreton Bay bugs on the barbie. Tasting Notes: Malt milkshakes, vanilla ice-cream, dusty lemons and lanolin. The palate begins with soft sweet wet earth and the peat slowly wafts in followed by green leaves, mocha and ironbark honey. Tasting Notes: Betadine, first aid kit, orange zest, sage, dry and tart cranberry sauce, hot metal singed timber and mandarin. 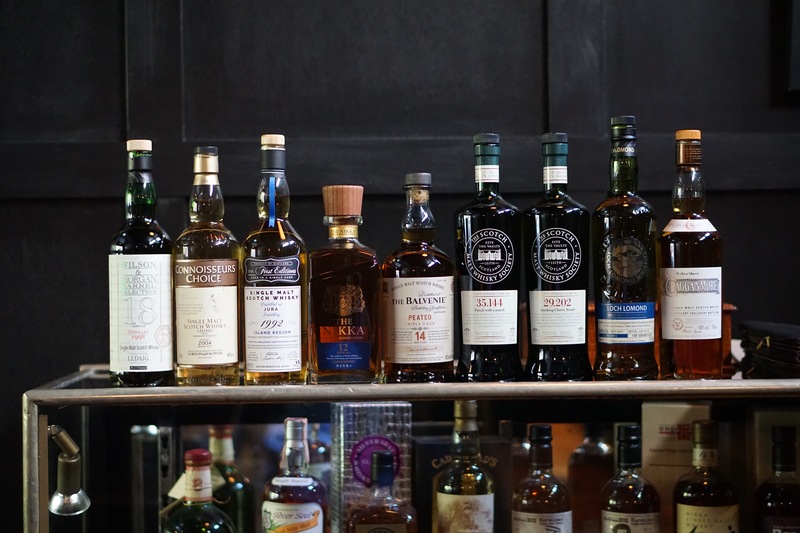 *On pour at Whisky & Alement from Wed 30 January 2019.